New report is the result of years of planning and a lengthy series of public meetings on the future of these valuable lands. City staff released the Pier 7 & 8 Urban Design Study yesterday evening. The 116-page report [PDF] is the result of years of planning and a lengthy series of public meetings on the future of the valuable lands along the West Harbour waterfront, owned by the City of Hamilton. The final proposal maintains the nine development blocks presented at earlier public meetings and will not surprise anyone paying attention to this file. Overall, the final plan calls for 110,000 square feet of new residential units for a total of 1,071 to 1,531 new residential units with 1,422 parking spots integrated into the buildings and a centralized parkade. The perimeter of Pier 8 will become an urbanized public access area with patios, an artificial beach, bike and cycle path, and other amenities. The existing park on the west portion of the pier will remain, and public art will be added throughout the perimeter. The report proposes building in phases, starting along Guise Street and moving closer to the waterfront in phases. The final Urban Design Study calls for "a high quality waterfront with a mix of public activity areas," "diversity of architectural styles and building massing," and a "human-scaled development that frames the streets and open spaces." It includes the implementation of green roofs, a "greenway" stormwater capture area that also serves as a pedestrian and bike path, and a focus on green technologies to reduce the environmental footprint of the new residents. The Urban Design Study says there are elements requiring additional study, including affordable housing. There is one remaining community meeting on the Urban Design Study, scheduled for Monday, May 2, 2016, 7:00 PM, at the Waterfront Banquet and Conference Centre, 555 Bay Street North. Council will begin consideration of the Study at a special West Harbour Development Sub-Committee meeting to be held at the Hamilton Waterfront Trust Building on Thursday, May 5 at 3:00 PM. Seating will be limited and on a first come, first served basis. Following this, the proposal will go to Planning Committee on Tuesday, May 17, and be ratified by City Council on Wednesday, May 25. This article was first published on The Public Record and is licenced under CC-BY-SA. I repeatedly brought this up in the past, and they seem to have listened on at least this one element (I imagine others have also wanted a beach parkette too). They removed the dreaded non-pedestrian-optimized traffic circle unfriendly to LRT/bikes that I brought up as well. So I feel, they listened to some elements of public feedback by many people, myself included. The location of the Hamilton's equivalent new beach parkette will provide a similar industrial-nature juxtaposed view, of Cootes to the left, and steelworks to the right. Swimming is not allowed, but doesn't need to be to enjoy relaxing. All of this will be open to the public, which is a great thing. One con: Lack of mixed-income aspect. It's a battle for another day -- one thing at a time. A suggestion is... Once Pier 7/8 redo is all done, then I'd recommend looking into a respectful/planned Regent Park style do-over of the low income housing next to West Harbour GO station. For Hamilton staff not aware, it's worth studying and visiting these new Toronto mixed-income developments, to see what's being achieved nowadays. Basically, add many more affordable housing units while adding market housing (in a win-win scenario) in a similar manner to Toronto's Regent Park revitalization, while taking into due consideration of existing residents guaranteed able to stay in better-equipped units in new mixed-income developments -- while also simultaneously making more affordable units available via densification -- while also simultaneously bringing market rate units to the now then-valuable area. That said, I overall, like this waterfront plan much better than the original "just a pier full of condos" plan. If the housing area is built by a developer, it will all be affordable to their target market. However if you are taking about social housing, or subsidized units, the City needs to be explicit and upfront what their expectations are as to number of units, size of units, and the nature of subsidy. Regent Park may work in Toronto, but look at the market rate in the area in general, and more specifically what condos that aren't subsidized go for in Regent Park (You can find listings for units with less than 400 square feet where they are listed for $259,000) The economics aren't as great here, in Hamilton but the implicitly subsidy will be reflected in the ultimate price a developer is willing to pay, or the non-subsidized condo owners will need to pay, either in the unit costs, or their ongoing condo fees. PS The storey must have the incorrect area, it is probably closer to 110,000 square metres, otherwise these units are really small! Staff is well aware of the Regent Park style revitalization approach for the Jamesville complex. The Deloitte report (real estate strategy for West Harbour lands) suggested the secondary plan would allow the existing 91 townhouses to become 330ish units in low-to-mid-rise apartments. The Ken Soble Apartments at 500 MacNab were pitched for private or public retrofit (i.e. tower renewal), but the secondary plan doesn't allow for much intensification on that parcel, so it was left as a ? mark. The challenge with the above is that the ratio of new to old units to make Regent Park work in Hamilton is seldom openly discussed. It isn't the 3 (and some odd) to 1 that the Deloitte report mentions. Lawrence Heights near Yorkdale Mall is undergoing a similar revitalization process and its ratio is 4 to 1. I'm told the ratio for Regent Park is considerably higher than that. As they say the devil is in the details. Many of the people living in Jamesville have indicated they want to stay in the North End. People living nearby Jamesville will have strong views on how many units, how tall, in what configuration or design, etc.? You are right on the UDS ... there is a lot to like, but no commitment to making it a complete community with a mix of incomes and household/family types. That is a political question, not principally a design matter, to be sure. That said, we should be careful not to fall for pretty pictures and miss that implementation is when things go from plan to reality ... how committed will Council be after they sell the land and developers decide the design concept needs to a "tweak" here and there? this plan seems pretty decent and though i am generally a pessimist i feel it is worth supporting if they clearly outline how to support a mixed income community here. if there are no firm commitments from the city on this (or any other) planning aspects of the waterfront fully expect a lot of the "tweaks" you speak of. Yeah -- and even if they match the artwork as closely as possible, the trees are easy to cheap-out on. Artwork embellished with fully grown trees. But instead of a bunch of good bigger pricey trees brought in, the baby saplings get planted. And then it takes 20 years before it looks like the original concept art. So don't cheap out on the trees, either! It's nice, but there's a lack of sporting facilities (beach volleyball courts, basketball courts, bmx track) though I appreciate the plan to convert the skating rink into a skate park during the warmer months. The other obvious worry is the lack of commitment to city housing among those nine lots. Someone could bring this up at 555 Bay Street North for Monday, May 2, 2016, 7:00 PM, that's the last community meeting. The skate rink could also handle impromptu basketball events when not used as a skate park. 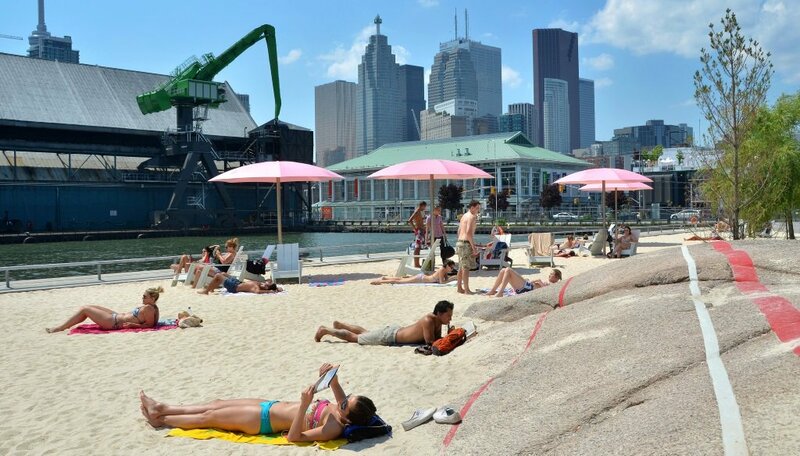 The onus is design; little things like requesting moveable parasol units rather than permanent parasol installation as in Sugar Beach (the urban beach parkette in Toronto). permanent parasol units are a horrible idea IMO. why have something that will need constant maintenance when there are realistically about 3 months of limited utility you can expect from them? make more places for activity in the city. beach volleyball would be cool. I've lost track... Is the City still considering a full sell off of these lands to developers or has the notion of keeping it and leasing it to them gained any traction? Full sell. This is still set up so a single private developer can run the whole show and make sustainable profit that could be the City's. I am impressed with the plan does anyone really think that private enterprise will build it that way? What would the institutional building be? A north end library finally? School? LRT Maintenance and Storage Facility? Oh no I forgot that last one is going to be at Barton Tiffany with all the community housing. Staff have not yet made a decision on the preferred location for the maintenance and storage facility. 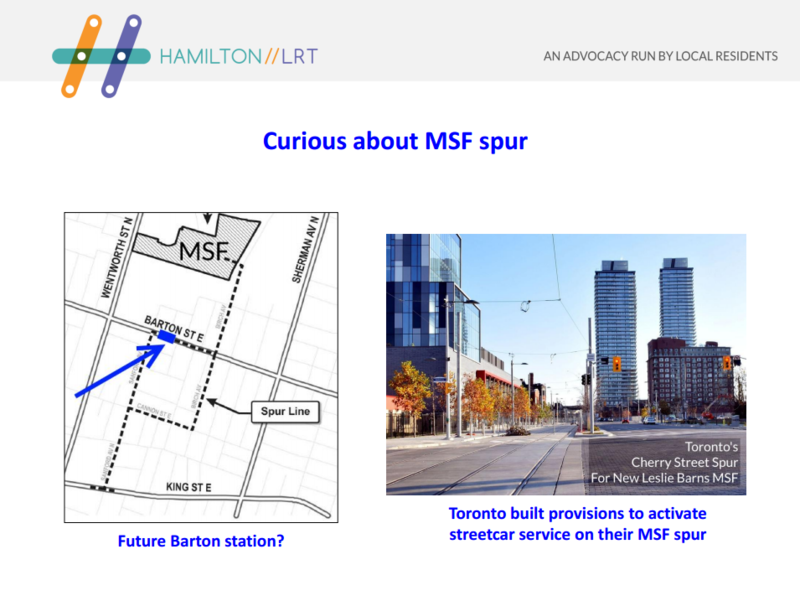 If the MSF is where it might be, Hamilton could copycat the same idea suggested to the Cherry spur of Toronto's MSF (Leslie Barns) by later putting a single Barton station on the spur to quickly shuttle people to/from King. Not necessarily at the beginning if there is not enough budget -- but to keep provision to active service on the spur at some point in the future when it is funded. It could be a rallying point for pushing forward a long-term revitalization of Barton. The Cherry Street spur is not associated with the Leslie Barns (they're about 2km apart). The Cherry St spur was built to support the West Don developments (former Pan Am Village) and eventually be extended south into the Port Lands to meet the East Bayfront LRT line. not often I say this, but I love this plan presented by the city. The keys will be in the details. They must pay attention to street design and building design. We can not afford to allow a developer to come in and slap up a bunch of brown stucco buildings with scrawny trees out front. 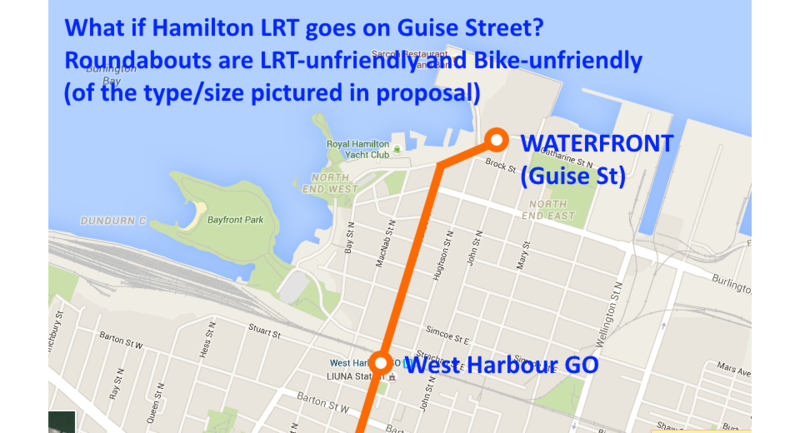 Hamilton is famous for great renderings becoming awful in reality. The public realm is key to this new neighbourhood. The pathways, beach area, trees, public art, patios, cycling/sidewalks, transit links etc.... Enough whining by the area NIMBY's who complain about traffic. They should focus their attention on making this a sustainable neighbourhood with fantastic transit/cycling/walking connections, not trying to jam in more cars, parking lots and wide streets to the north end. I hear some people complaining that there's no giant open space in this plan. From Pier 4 to Cootes Paradise is nothing but a giant open space. We need some development along the harbour to create new housing and new retail/business opportunities. I'm glad we've done our waterfront opposite from Toronto: public space first, now residential. They would kill to have Pier 4 and Bayfront Park along Toronto's harbour. We've got them. Now let's add some new neighbourhoods to increase the city's urban population, tax base and offer new housing options. As context, the new waterfront appears to be roughly 50% public space. Some of the art makes it look like condos take up most of the space, but it looks like a very good and reasonable balance. Assuming "avoid watering down the plan" and "solve the mixed income issue". The white colored areas are also open to public -- roads+bike+sidewalk. 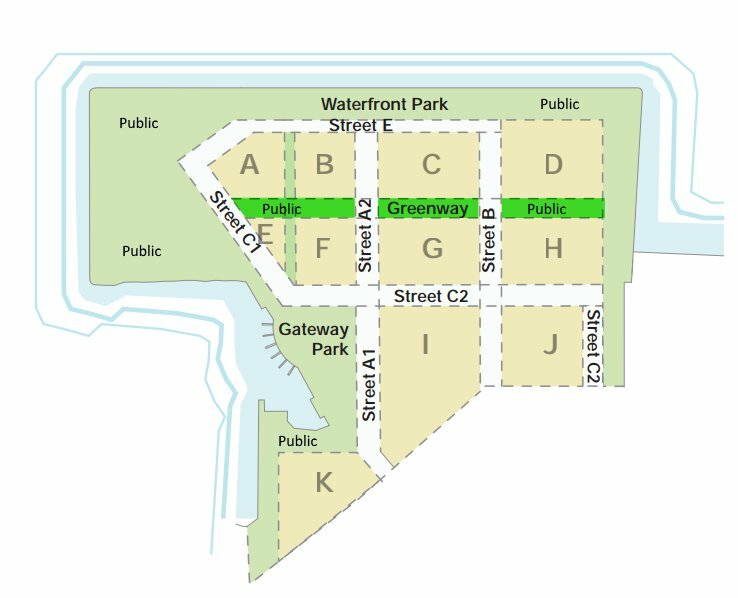 as I mentioned earlier, the entire waterfront is public open space, so I'm not concerned with using yet another Pier for empty parkland. This plan looks great. Also, 'mixed-income' won't be happening here. The only way it could is for some extra height granted to the eventual developer, and the local residents in the area have made it clear they will hold up any project in court for years that dares to be taller than a building in Caledonia. I think we'll see a nice mixed-use project happen at the under-utilized townhouse property near the new GO Station, and along the Barton/Tiffany areas.